We have been traveling to Sibiria on a fairly regular basis, over 9 years now! We always stayed with friends and their families in the City of Irkutsk. In Germany people asked whether we could arrange accomodation also for other backpackers. Now we can! In March 2003 the first Backpacker Hostel of Irkutsk started up, situated only a few minutes by bus from the centre of the city . We guess it will take a little time to substitute the Russian-style-skyscraper building we now welcome our guests in with a traditional wooden Sibirian hut surrounded by a blooming backyard in the core of the city... But vsyo budyet, as a Russian saying goes, means it will work out finally, not full speed ahead, but slowly and steadily as everything goes in Russia. Nevertheless you are already welcome at 136 uliza Lermontova, first floor, in a typical Russian three-bedroom flat with all facilities a traveller needs and which indeed is a comfortable solution for the now! 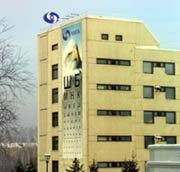 Situated between the Railway Station and the dam at the River Angara, on uliza Lermontova 136. Get off at the bus and Marshrutka station Mikrochirurgia glaza. From there it's a 1-minute walk to the Hostel. The apartment is located on a new red brick five floor building near the stop. Look for the advertisment of the shop called "Trojka". The Hostel is just behind the corner. Or you catch a taxi. From the city centre the fare should be around 150 Rbl. From the airport or the railway station it should be less but you always have discuss with the driver. So it's better to walk to the next big street or to call a regular taxi service (222-777 or 311-011, 333-555, 444-666, 555-777, 22-22-21). Please find current prices here.